My first bound book. (Hopefully not the last!) Technically a vanity publication, but I'll take it! Yes, that is my copy of my bound thesis. 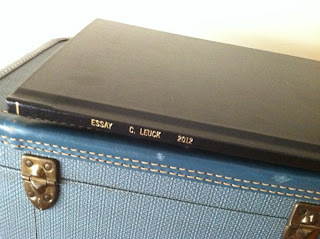 I am somewhat miffed that my full name was not on the spine — after all, it does not look like my name to me; I do not associate myself with the name C. Leuck, as that is also the first initial and last name of both of my siblings; we used to get magazines addressed to C., C., and C. Leuck — but I am so excited to have a copy of my writing all done up like a real boy book. Sorry, had a Pinocchio moment there. The conference, Conversations & Connections, was hosted by Barrelhouse Magazine, in what I believe to be some kind of partnership with the Johns Hopkins writing program and perhaps some other area literary organizations. And while they did a top-notch job on putting together a great line-up of events, the parts I enjoyed the most and were perhaps the most valuable to me were simply the, uh, well the conversations and the connections. One of my favorite conversations was over lunch with a group of writers who I mostly knew at least a little. The experience ranged from no publication to a journalist who recently won a journalism award, but we all had pretty nearly the same insecurities, doubts, fears about writing. The interesting thing to me was that the "I was afraid to own the title of 'writer'" conversation came up. This is a reoccurring conversation among writers. It is, in a way, your origin story, or at least the interesting story. How did you first begin calling yourself a writer? For me, it was maybe a little easy because when I was in high school, the Lord of the Rings movies were coming out. This was a Big Deal and a Hot Topic around the lunch table, particularly as all of my friends were enormous geeks and nerds. (Hi, guys!) At that point, I had been writing short fiction stories for a while — to the extent that I wanted a laptop for the sole purpose of having MS Word all to myself, although I never shared that desire with anybody — and suddenly, fanfiction was in. And I mean, it was in. People would print out their favorite stories off the internet (give us a break, we had only gotten email addresses the year before, and we all shared one computer with an entire family, so screen time was limited) and pass them around the lunch table. So it somehow became natural that I began writing my own LOTR fanfiction that was passed around the lunch table. I ran across one of those folders in my old closet at my parents' house, and I have to tell you it is one of the most terrible things I believe I have ever written. But it was fun, and I had an audience, and people were encouraging and always wanted to know when the next chapter would be done. One friend and I wrote collaborative stories over AIM. Another friend and I worked for some time on a story based on two Italian young ladies who wrote letters back and forth to each other, mostly by writing the letters back and forth to each other as these ladies. I wanted to be a writer, but I didn't know what I would do with a degree in English. I did not think I wanted to teach. So instead I went into the sciences, which made sense as I loved science and thought it was fascinating. But I kept writing — mostly poetry and short fiction. I submitted a story to a competition for the first time and got an honorable mention, which I now realize was probably more of a completion award than anything else. I continued writing fanfiction. Eventually, I decided to double-major in Professional Writing, encouraged by my mom, and later dropped the science major altogether. I already thought of myself as a writer. I write, therefore I am a writer. In the Purdue Professional Writing program, the first question you are asked is "What is a Professional Writer?" (I address that question in a guest post on Arlee Bird's blog.) And right out of the gate you are thinking of yourself as a writer and trying to say what it is that you do, and owning it. At this point, I've introduced myself as a writer so many times, that I sometimes have a difficult time grasping what it is like to not own the title, to feel like an impostor. But boy-o, other times I really do feel like an imposter. I haven't had anything published with my byline, unless you count the high school student-run paper, so sometimes I do question myself. Am I a real writer? Or am I no more than a child playing make-believe? 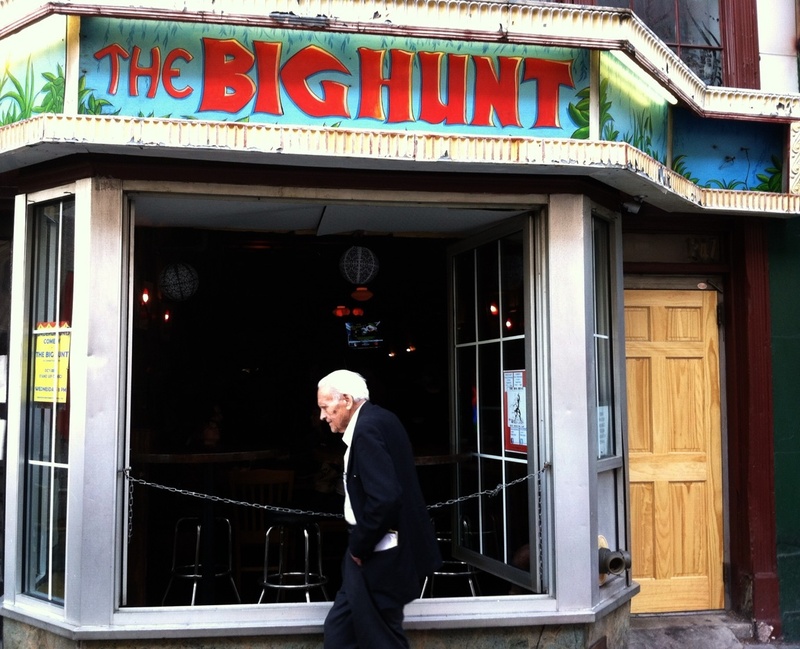 After the conference, we retire to The Big Hunt for drinks and readings. A poet from Pennsylvania introduced me to the Manhattan, so you can bet that's my new favorite. Then I hear published, lauded authors (ooh la la!) at panels at Conversations & Connections talking about how they doubt themselves and how they question what they are doing. And I sit down to lunch with people whose writing I've read and who I've taken classes with and I will swear they must have a dictionary of beautiful language hidden in the neurons of their brains because everything they write is so damn beautiful I cannot even stand it — and they say they feel like posers and like they have to defend their time and their work, as though it's not real work and doesn't take time and effort and sometimes loss of sleep and hair-pulling-out and tears and the disappearance of entire bottles of wine and other assorted spirits and lamentation and wailing and woe! But seriously, that these people have these insecurities, these fears and doubts, when they clearly ought not to because their work is so amazing and they've been published and sometimes even won freaking awards — well, maybe it's okay that I sometimes think that way, too. Then I go home and listen to Neil Gaiman's Make Good Art speech. And then I write.